Dr. Estés presents the final volume of the Dangerous Old Woman series. 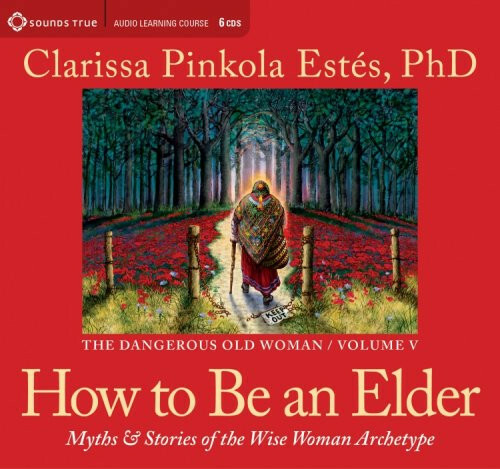 Dr. Estés’ five-volume audio masterpiece, ‘The Dangerous Old Woman,’ ends with this volume ‘How to Be an Elder.’ It seems right that the series ends here. Although each volume can be listened to in any order, it is helpful to have listened to the previous recordings as a foundation to this one. To those unfamiliar with her work, it is difficult to describe the wisdom, insight, inspiration and stories packed in each volume of this series. With the myriad skills of a therapist with decades of experience, and a depth psychologist and Jungian analyst at the top of her game, Dr. Estés deftly blends well-known stories, personal family legends and insight into a series of audio recordings that engage and inspire the listener. As is usually the case with great work, teaching happens at many levels. Although Dr. Estés is a certified Jungian analyst, that label is too limiting. While Carl Jung and Joseph Campbell raised awareness of Archetypes, many cultural stories, legends, myths and wisdom have passed on from our ancestors for millennia. Often practitioners of depth psychology become Jungian analysts as a result of their education and studies. Dr. Estés seems to have been born to become one of our generations greatest oral and written story tellers, commune with Archetypes, Saints and Angels, as well as maintain a relentless desire to help, inspire and advocate for others. One of the greatest gift of this series is its ability to guide the listener to discover Who They Really Are, nurture and empower their “Original Voice,” and cast off social, cultural and personal bindings that separate the listener from his or her destiny and birthright. How to Be an Elder could be a descriptor for most of Dr. Estés work. All of us are engaged in a spiritual, physical, emotional and mental journey from childhood to adolescence to young adulthood to adulthood to middle age to becoming Elders. And what is an Elder? There are many good answers in this recording, but in part being an Elder is to live the destiny inherent in all of us. Using classic stories such as ‘Rapunzel,’ ‘Sleeping Beauty,’ and ‘Rumpelstiltskin,’ Dr. Estés weaves her experience, learning, stories and wisdom in how to be a great Elder. Throughout this series, one character, Aunt Edna (an eccentric, flamboyant, tough relative), exemplifies how to be an Elder and how to do in a way that matters—with our individual, one-of-a-kind “Original Voice.” This recording lays a foundation of how to live that eccentric, creative opportunity in each of us and become a true Elder. While it is easy to think these audio recordings are intended for adults, they are While it is easy to think these audio recordings are intended for adults, they are easily accessible to adolescents and young adults. Like the best timeless wisdom teaching, they contain messages for listeners of any age or stage of growth and development. For the observant listener, the art on each recording cover is a symbol for the series.